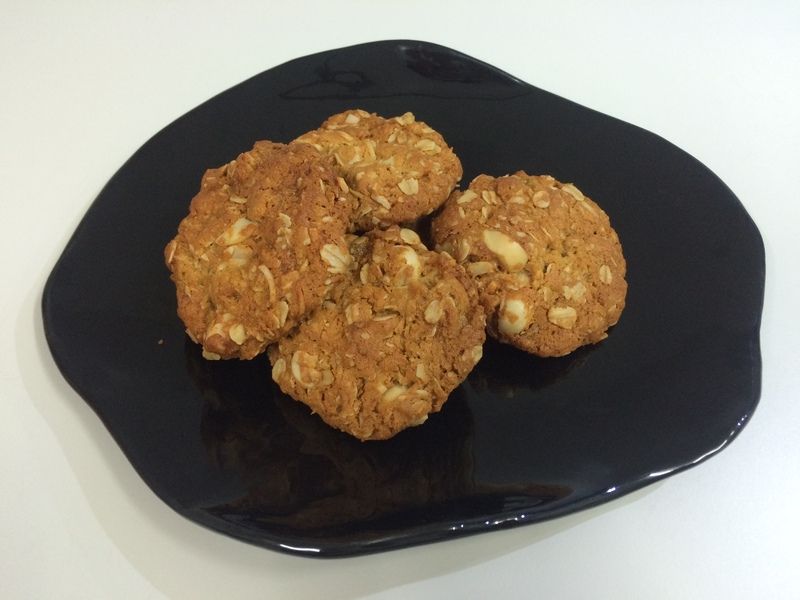 Macadamia ginger Anzac biscuits are a variation on a traditional Australian recipe. The basic recipe dates back at least to the 1920s, but has been widely modified since then. Like most modern versions, this recipe adds shredded coconut, but also candied ginger pieces and chopped macadamia nuts. The recipe can easily be adapted for gluten-free baking by substituting commercial gluten-free plain flour. You can also make a vegan version by replacing butter with coconut oil. If you use coconut oil, which has a lower and sharper melting temperature than butter, you should lower the baking temperature to 150 °C. The biscuits will be flatter and more brittle than if made with butter, but still delicious. Pre-heat oven to 160 °C (fan-forced). Using a sharp knife, chop macadamia nuts and crystallized ginger into 5-10 mm pieces. In a large bowl, mix together plain flour, caster sugar, rolled oats, coconut, ground ginger, chopped macadamia nuts and chopped ginger. Separately, melt butter over low heat and allow to cool slightly. In a small bowl, add boiling water to baking soda. Stir to dissolve, then mix in golden syrup and add the melted butter. Add the liquid ingredients to the dry ingredients, mix well and form into balls, using a little force to hold them together. The dough does not bind particularly well at this stage, but will hold together when baked and cooled. Bake 18 min on greased, paper-lined baking trays. The balls will flatten down as they bake. Allow to cool fully before removing from trays.